How much do certificate colors vary? The easy answer is quite a lot. But the reasons need explanation. The variability you are likely to see is somewhat time dependent  older certificates are likely to show greater variability than later certificates. But, like every other "rule" in this hobby, let's not overstate matters. Today, printers can create most colors on four-color presses using the typical "CMYK process color" palette. If you have ever used advanced photo imaging programs (like Photoshop), you have encountered the concept of "CMYK". The letters stand for typical pigment colors used in printing. Actually, "4-color" is a misnomer, because there are really only three colors plus black. The yellow pigment used in printing inks has been around for a long time. But clean and predictable cyan and magenta pigments are fairly recent inventions. Go back to early stocks and bonds and you will see examples of the color palette available to printers at the time. Today's computer monitors use these colors. Rendering the "RGB" palette accurately into a CMYK palette is tough to do, so do NOT be surprised when the colors you see on your screen do not match up with a scan of a certificate. Unless you use special calibration equipment, you will NOT see true colors. Before the 1850s, it is hard to find large areas of documents covered with colored inks. You will, however, see many examples of limited uses of reds, blues, and greens. Yellow has never been a popular color for certificates because yellow ink on white paper is rather unimpressive. And yellow on blue or blue-gray paper yields a sickly green. By the 1850s, the printing trade was able to buy pure (and predictable) red, yellow, and blue inks, in addition to the standard black. By mixing two or more of the primary colors, printers could devise a myriad of intriguing colors, particularly orange, purple, brown, and the ever-present green. Typical certificate printers in the 1850s and 1860s used letterpresses. Letterpresses were widely variable, but they typically had a flat plate which held a thin layer of ink. Rubber rollers would pick up ink and transfer the ink to metal or wooden plates. The plates, in turn, would be pressed into dampened pieces of paper, one at a time. The process allowed for incredibly detailed printing, but the "through-put" would have been less than a hundred pieces per hour. So, from the beginning of a workday to the end, the ink would have needed replenishing many times, if for no other reason than that the ink would dry on the metal supply plate. But here is the problem. Colored inks might have needed several mixings to complete large jobs, even if the job only took one day. We do not know what the recipes were like, but a recipe for a typical "green" might have been something like, "two spatulas of blue, one spatula of yellow, a knife-tip of medium red, and a knife-tip of black." If colors were mixed from scratch, it was impossible to ever mix two batches of colored ink the same. Especially if you consider that the time between certificate orders might have several years. And, remember, one company's "medium red" color was almost never identical to another company's "medium red." Here are several examples of "green" all scanned on the same device within a five minute period. See the variations? Have you ever dabbled in painting? At one time or another, practically everyone has mixed colors for some sort of hobby painting. And if you have ever tried to match colors, you know it is very difficult. Especially because some pigment colors are more powerful than others. The reason is that the impression of "color" is really created from light reflecting off microscopic particles in the pigments. And predicting how one particle of pigment will interact with another is tough, tough business. And then there was American Bank Note Co! 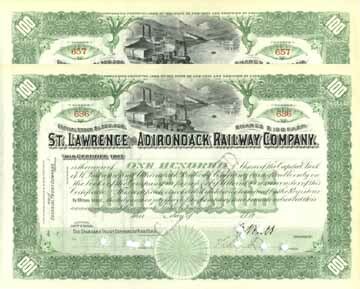 The American Bank Note Company (and related companies) probably accounts for 60% of the railroad-related securities represented in this database. Of all engraving companies, ABNCo was the most obsessed with controlling colors. That company was so serious about colors that it even ground its own pigments and manufactured its own inks. 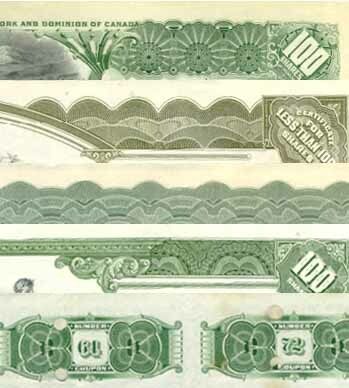 American Bank Note Company controlled color more carefully than any other company that printed certificates. And one of the things that company did was create special colors that are terribly hard to describe. The idea was to create colors that no ordinary forger could duplicate without extreme effort. American Bank Note Co. was extremely successful in this effort. But...even having said that, you WILL see variations, even among ABNCo certificates. You will find huge variations in the descriptions of the colors of otherwise identical certificates. Forall of these reasons, I have made a three personal "rules" about describing the colors of certificates for this database. Rule 1. I will NOT separate certificates into sub-varieties based on color alone, unless the color differences are distinct and large. Rule 2. I will NOT split hairs over color descriptions. Rule 3. I absolutely will NOT arbitrarily believe the "colors" I see on the internet. I do not want to belabor this point, but I do not have the time to argue whether a certificate might properly be called "red" versus "dark red," "maroon," "blood red," "wine," "auburn,""pink", "rose" or "burgundy." Or "turquoise" versus "aqua," "blue-green," "greenish-blue" and so forth. There are thousands of descriptive words used for colors in English. And thousands more in other languages. Given a chance, I use simple descriptions even though they may not be 100% correct. I will tend to use "green" or "olive" for the most common certificate color. Yet, someone might call a certificate "pea green" and try to convince me to change a description. I might even agree. But really...what exactly is "pea green?" What species of pea are we talking about? Are the peas fresh? Or canned? Or froze? Baby peas? Green Giant peas? Are canned peas the same color as fresh peas? Here is an example of the colors on two certificates of the same variety issued eleven years apart. Part of the color difference can be attributed to paper yellowing on the top example from 1925, but the later certificate is definitely a darker shade of green. What about "sky blue?" Where in the sky can we find "sky blue?" At what time and in what latitude? In what direction and at what season? At what humidity and particulate load? I use the term "rust" quite frequently to describe the"reddish-brown" or "brownish-red" colors seen on hoards on modern certificates. I mean for the "rust" designation to hint that such certificates are a little redder than typical "chocolate brown" certificates. But, truthfully, I would be hard-pressed to find examples of ferrous oxidation that closely resembles that color. Most "rust" is really quite black except when dripping down the sides of on old white automobile. So why waste time arguing? The heart of this obstinance is that I do not believe two people will ever agree on color definitions. As an experiment, take four or five differently colored certificates and ask several friends to tell you what colors they see. Unless you have friends who are color specialists with calibrated colorimeters, I do not think you will find much agreement. Subtle, but still noticeable color differences on identical certificates, serially numbered only twenty-one certificates apart! (front = #636, back = #657) The certificates show very similar shades, but #636 definitely shows a more "saturated" color. Let's enjoy this hobby for the certificates, themselves... and forget about arguing about colors.